Creepage is the separation between two PC board solder eyes as measured along the surface of the board. 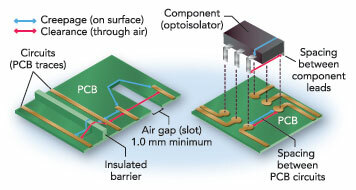 Clearance denotes the shortest distance between two conductive parts as measured through the air. Artwork by Melinda Vaughan, National Instruments. End system specifications, such as IEC60950-1 and IEC61010-1, dictate the required creepage and clearance spacing for a given end system. IEC60950-1 regulates the requirements for Telecom Equipment, and IEC61010-1 regulates the requirements for Industrial and Test Equipment. The greater the creepage distance, the higher the external safety protection. As always, the amount of it distances required for a given mode depends on the end system specification. In general, this distance is dictated by the Pollution Degree of the environment in which the system will be used and the highest operating voltage present in the system. This distance can be decreased if an isolation component has been qualified to a higher proof tracking index (PTI) rating. In many cases, the distance can be cut in half if the component is rated to Material Group-I instead of Material Group IIIa or IIIb - the most common ratings for components. fingerprint thermometer app iPhone Getting an information technology degree makes perfect sense in a world where the technology's expansion rate shows no signs of slowing down. It is safe to say that you are transforming something else? Demonstrate whether the update implies new client bolster projects or changes to some other part of your organization's association with the client. Notwithstanding, the opposite is additionally valid. If you somehow happened to bring down the encompassing (or encompassing) temperature, at that point you would bring down the resistor esteem also. The technology is now available to do a reverse phone lookup on a land-line phone or cellular phone! information passage and accumulation, and in this way additionally limit odds of blunders and utilization of time. I am very much pleased with the contents you have mentioned. sd vidya school noida I wanted to thank you for this great article.